This is the First call for papers for the 10th European Conference on Games Based Learning( ECGBL 2016) hosted by University of the West of Scotland, Paisley, Scotland on 6-7 October 2016. The conference committee welcomes contributions on a wide range of topics using a range of scholarly approaches including theoretical and empirical papers employing qualitative, quantitative and critical methods. Action research, case studies and work-in-progress/posters are welcomed approaches. PhD Research, proposals for roundtable discussions, non-academic contributions and product demonstrations based on the main themes are also invited. You can find full details in the submission types document (pdf format). Electronic Journal of e-Learning (ISSN 1479-4403) – now indexed by SCOPUS. We invite applications from students and staff who wish to attend the next ESERA summer school, which will be held in České Budějovice, Czech Republic, 22 – 26 August 2016. Are you PhD. student in the science education? Don’t forget to send your proposal to the ESERA Summer School 2016! Are you researcher in the science education? Come to the ESERA Summer School 2016 as a coach! Call for applications is now open! Come to the beautiful town of Ceske Budejovice in the Czech Republic in summer time and meet other PhD students and coaches from different countries. The historical city of Ceske Budejovice, founded in 1265, is located on the confluence of the Vltava and Malse rivers in South Bohemia close to the borders with Austria. You can come by train, by bus or by plane (from the Prague International Airport (approx. 150 km, connection every hour). Notes on applying can be downloaded here. Applications should be submitted via website https://esera2016.jcu.cz, where forms for students and staff are provided. Deadline for applications is 31 January 2016. WorldCIST’16 – 4th World Conference on Information Systems and Technologies, to be held at Recife, Brazil, 22 – 24 March 2016, is a global forum for researchers and practitioners to present and discuss the most recent innovations, trends, results, experiences and concerns in the several perspectives of Information Systems and Technologies. Pervasive Information Systems (PIS) extend the Information System paradigm by introducing a set of novel characteristics into the society. This workshop aims to discuss topics related to PIS, evaluate the importance for the society and the creation of new knowledge overcoming temporal and local barriers. This workshop is focused on demonstrating how to take advantages from this new sort of information systems and which kind of solutions can be developed in order to support the decision making process anywhere and anytime. 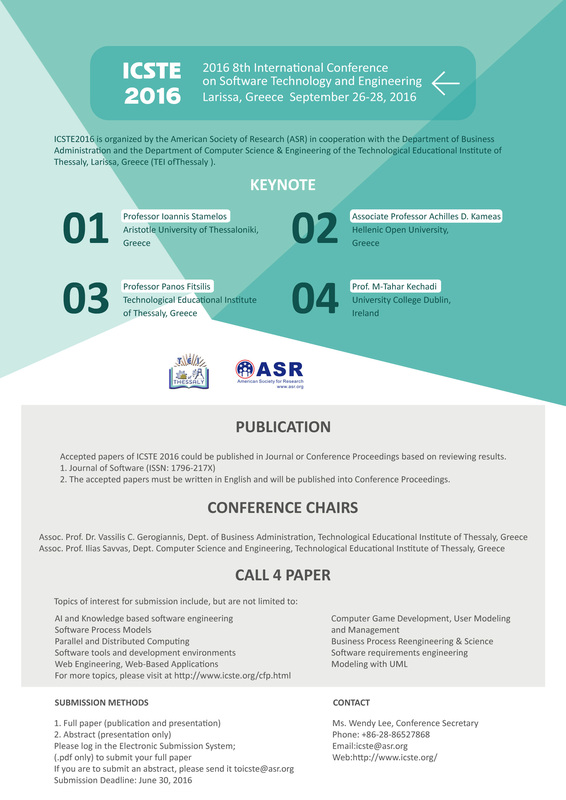 PIS 2016 is the ideal place for bringing together the researchers who are working in this particular area of information systems in order to promote discussion and explore new scope of scientific contributions. Having conscience of the most recent situation in Europe and the Horizon 2020 strategy, a deeper analysis should be made on this emerging topic. Authors are invited to submit unpublished work, contributing with research papers, case studies and demonstrations that present original scientific results, methodological aspects, concepts and approaches in the multidisciplinary field of PIS. Authors should present new trends, discuss future challenges and understand how information affects the way humans interact with the built environments occupied by them. Full paper: Finished and consolidated R&D works. These papers are assigned a 10-page limit; and Short paper: Ongoing works with relevant preliminary results open to discussion. These papers are assigned a 7-page limit. Submitted papers must comply with the format of Advances in Intelligent Systems and Computing Series (see Instructions for Authors at Springer Website or download a DOC example) be written in English, must not have been published before, not be under review for any other conference, workshop or publication and not include any information leading to the authors’ identification. Therefore, the authors’ names, affiliations and bibliographic references should not be included in the version for evaluation by the Program Committee. This information should only be included in the camera-ready version, saved in Word or Latex format and also in PDF format. These files must be accompanied by the Publication form filled out, in a ZIP file, and uploaded at the conference management system. All papers will be subjected to a “double-blind review” by at least two/three members of the Program Committee. Based on Program Committee evaluation, a paper can be rejected or accepted by the Conference Chairs. In the later case, it can be accepted as the type originally submitted or as another type. Thus, full papers can be accepted as short papers. 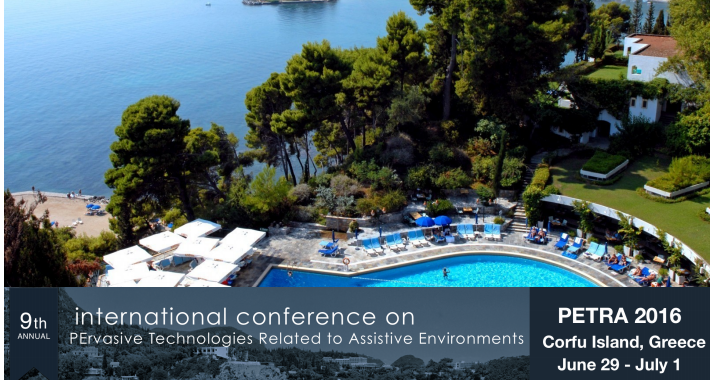 The authors of accepted full papers will have 15 minutes to present their work in a Conference Work Session; approximately 5 minutes of discussion will follow each presentation. The authors of accepted short papers and company papers will have 11 minutes to present their work in a Conference Work Session; approximately 4 minutes of discussion will follow each presentation. Workshop papers will be published in the Springer Conference Proceedings. To ensure that a paper is published in the Proceedings, at least one of the authors must be fully registered by 27th of December 2015, and the paper must comply with the suggested layout and page-limit. Additionally, all recommended changes must be addressed by the authors before they submit the camera-ready version. No more than one paper per registration will be published in the Conference Proceedings. An extra fee must be paid for publication of additional papers, with a maximum of one additional paper per registration. Full and short papers will be published in the Conference Proceedings by Springer, in Advances in Intelligent Systems and Computing. Published full and short papers will be submitted for indexation by ISI, EI-Compendex, SCOPUS and DBLP, among others, and will be available in the SpringerLink Digital Library. Extended versions of the best papers accepted and presented at this workshop may be considered for publication in a Special Issue of a renowned international journal indexed by ISI, SCOPUS and DBLP. New pedagogic approaches: 2nd international conference in Dublin. The Anti-Bullying Centre of Dublin City University will host the second international conference of Sonet-Bull, a project financed by the European Erasmus+ Programme to identify common strategies to prevent and counter school bullying phenomena. The appointment is for November 18 at 2 pm. The initial results obtained with the on-line platform for schools, families and all other actors involved in this phenomenon will be presented during the event. SONET-Bull is a two-year project implemented by the Greek National Agency as part of the Erasmus Plus Programme, Key Action 2 “Strategic Partnerships” to prevent and counter school bullying. 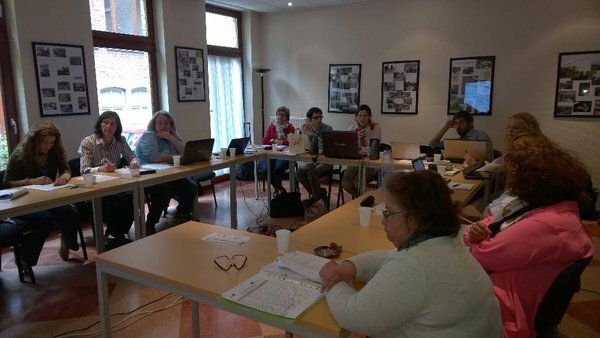 The programme, which is promoted by five partners from four European countries (Hellenic Open University, Greece – INFOREF, Belgium – Computer Technology Institute & Press Diophantus, Greece – Fondazione Mondo Digitale, Italy – Dublin City University, Anti-Bullying Centre, Ireland), is based on the concept that bullying cannot be countered through isolated actions, but rather requires educational strategies and innovative tools that can lead to the creation of networks and educational communities. The project is also based on the use of the www.sonetbull-platform.eu platform to share good practices and strategies to counter bullying. The international conference will be held on November 18, 2015, at 2 pm at the National Anti-Bullying Research and Resource Centre at Dublin City University. “Partners involved in the EU Sonetbull Project are meeting in Dublin from 18-20 November at the National Anti-Bullying Research and Resource Centre in Dublin City University. As part of the project a number of EU partners are working with DCU to develop an online space using ICT social networking tools with peer learning and crowd-sourcing to train school communities to counter student bullying. The three days of meeting will begin with the launch of a new national anti-bullying website by the Irish Minister for Education and Skills” explains James O’Higgins Norman, Director of the National Anti-Bullying Research and Resource Centre in Ireland. “The first version of SONETBULL Platform is ready. The platform is a peer learning platform which integrates social networking tools (Blog; Forum; Wikis; Tag cloud) and allows register users to access accredited training material on school bullying, to publish their experiences and to comment and tag the experience of their peers. In particular, users can share their experience in school bullying in a form of learning objects that are available through the platform. Those Learning Objects are: anti-bullying policy; bullying episode; case study, discussions; educational activities; survey and wiki” points out Catherine Christodoulopoulou, spokesperson for Computer Technology Institute and Press Diophantus (CTI) in Greece. The platform is a strategic tool to implement a dedicated educational course for all members of school communities to adequately prevent and counter school bullying phenomena, developing collaborations between schools and families and providing the necessary support both to victims and aggressors involved in bullying incidents.